Home > Questions > Can I have double chin injections whilst taking Roaccutane? Can I have double chin injections whilst taking Roaccutane? We advise that you should not have double chin injections if you are taking Roaccutane. The first rule in medicine is ‘Do no harm’ and this over arches everything that we do in Medicine. 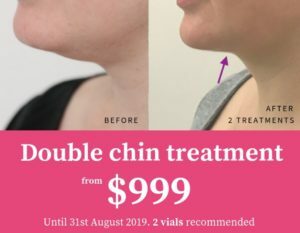 There are no studies at present that have looked at the safety of double chin treatment whilst on Roaccutane and so we are unaware of the potential risk. The best thing to do is to treat the double chin area once you have stopped your Roaccutane treatment. Bear in mind that we cannot treat you with double chin injections if you have active acne under the chin.